No, the sheriff did not compare constitutionalists to ISIS. My conversation with Infowars reporter Mikael Thalen where I make it very clear Knezovich is not comparing all constitutionalists to ISIS. Infowars reporter Mikael Thalen contacted me on Facebook recently, I was very, very clear that, in his comment, Knezovich was only speaking about people who wish for a revolution in this country, and will lie to get it. Not just anyone who critiques the government. He does worry that anti-government rhetoric, like the kind from Rep. Matt Shea, may inflame those revolutionary types. And what do you know, Infowars' headline says exactly what didn't happen: "SHERIFF COMPARES CONSTITUTIONALISTS TO ISIS." Nope. In the same Infowars article, Rep. Matt Shea expressed outrage at Knezovich’s latest comments. In our article, the Sheriff never mentions the word "Christian" once. And his ISIS comparison never used the word constitutionalists once either, specifically talking about those willing to lie to "hit the reset button" and revolt against the government. In fact, he's condemned extremists who've hijacked the word "constitutionalist" for their own ends. 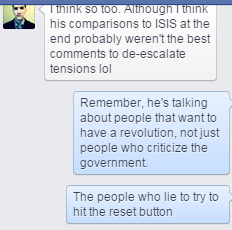 Knezovich's ISIS comparison only applied to lying revolutionaries, without using the word "constitutionalist" once. Assuming Infowars is quoting Shea accurately, Shea is either misreading, intentionally or unintentionally, Knezovich's comments. Or he's redefining constitutionalists (and Christians) to mean "those folks that want to overthrow the government, period" and who "want to hit a reset button."